Nic Shearer, a Fremont County Farm Bureau member, stands on a levee that’s holding back water from the flooding Missouri and Nishnabotna rivers. 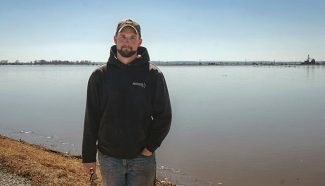 The fields Shearer farms with his family, as well as the family’s grain bins, are underwater behind him. Iowa Farm Bureau Federation's economists say Iowa may see upwards of $2 billion in damages from recent flooding in Iowa, which the National Oceanic and Atmospheric Association said may peak again once snow melts make their way down from neighboring northern states and heavy spring rains arrive. The state's largest general farm organization said damages from the Missouri River are not complete and the Mississippi River's anticipated flooding has yet to hit, which will make this a challenging year for Iowa farmers. Sam Funk, IFBF's senior economist, said the damages will continue to culminate long after the floodwaters recede. 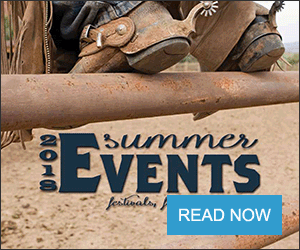 "In Fremont County, for example, where we have seen more than a quarter of all jobs depend on agriculture and 19 percent come from crop farming alone, there will be a snowball effect from this early spring flooding. Long after waters recede, the sand and debris left behind must be cleaned up before planting. But, the equipment to remove that debris is not always available quickly and fields may not be ready in time for farmers to get a crop in at all this year," Funk said. "There are infrastructure problems compounding current on-farm struggles. There have been multiple breaches in levees with roads and bridges rendered unsafe or impassable, which makes it hard to move the equipment in and the product out. The areas impacted are more extensive than the 2011 Missouri River flooding, where more than 127,000 crop acres were lost. This flood isn't just bigger; the effects will last longer." This year's planting challenges may not be the only thing impacting agriculture. Iowa livestock farmers were challenged by floodwaters directly impacting animals or in accessing roads needed to care for livestock or transport them to market. 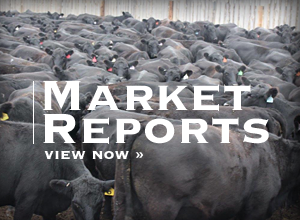 It's too early to know if those challenges will impact meat prices for consumers.